Saffron is one of my favourite spices. I’m a huge fan of the delicate flavour of lemons and when used in a cake it gets all the more exciting. 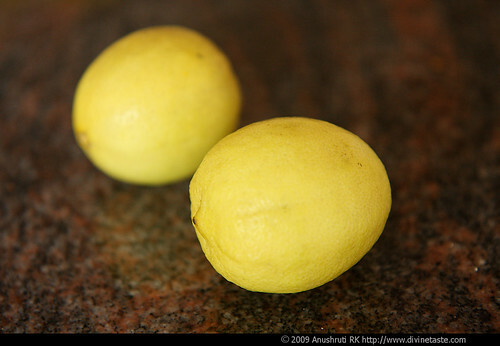 Lemons are a rare treat for me since we in India usually have access to the lime. I was totally elated when I chanced upon some gorgeous fresh lemons in the local farmers market. Ever since I read about these cakes in Quick Vegetarian Dishes, I have been intrigued by the interesting combination of saffron, lemon and coconut. Although I didn’t stick to the original recipe and adapted it to suit my taste, I retained the key flavouring ingredients, saffron, lemon and coconut. The cakes came out super soft, not dense like the usual cupcake textures. The frosting had the perfect citrusy tang. The heady dominating presence of the saffron with the mellow flavours of the lemon along with the subtle appearance of desiccated coconut makes this an unforgettable experience. Growing up, I was an Enid Blyton addict like many others out there. Looking back I was always intrigued with the food that was written about. The adventures of all her characters always gave food and eating such an important role. The cakes, breads, scones and biscuits sounded so delicious and made me dream each and every time I picked up a new title. Enid Blyton made even simple and humble bread and butter sound so delicious! When I read about High Tea treats at My Diverse Kitchen, where Aparna is guest hosting Meeta’s monthly mingle, I was immediately transported to the world of the characters of Enid Blyton, Jane Austen and Agatha Christie. 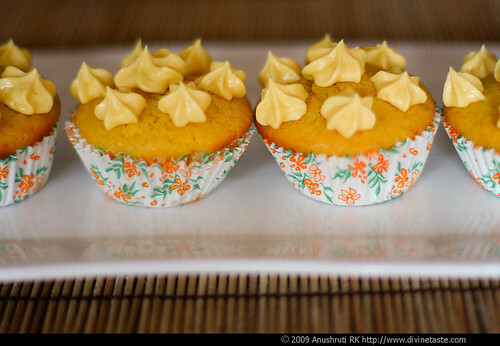 Saffron, Lemon and Coconut Cupcakes would be something I would serve my special guests at teatime and I’m happy to send these cakes to this online tea party. Line 12 cupcake molds with papers, or butter and flour them. In a small, heavy bottomed skillet or frying pan toast the saffron threads for approximately a minute on a low flame or until they are just heated. Over heating can burn the delicate saffron threads. This will make it easier to grind the threads into a powder and also release the flavours. With a mortar and pestle grind the threads into a fine powder. Steep the saffron powder in 2 tsp milk. 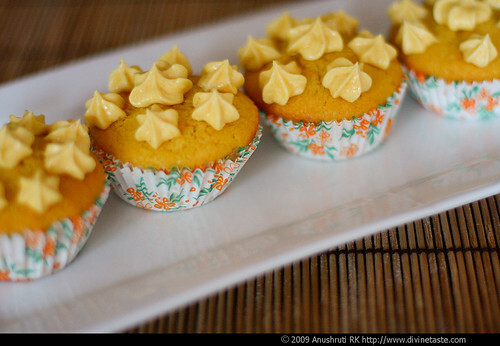 Reserve ½ teaspoon of the saffron infusion for the frosting. Preheat the oven to 160° C / 325° F/ Gas Mark 3. Sift together the flour, baking powder and baking soda. Cream the butter and sugar in a large bowl until light and fluffy. Mix in the lemon zest, yogurt and the saffron infusion, and beat until properly mixed, about 2 minutes. Put in the coconut, half the milk and flour mixture. Beat until well mixed. Fold in the remaining flour and the milk and beat until you get a uniform mixture. 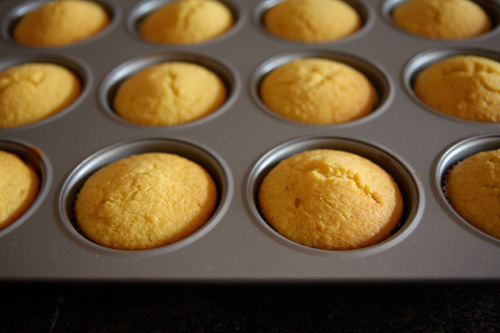 Divide the batter among cupcake molds. Bake for 20 minutes, or until a skewer inserted in the centre of the cake comes out clean. Allow to cool before frosting the cakes or else the frosting will melt over the cake. Sift the icing sugar into a bowl. Mix in the butter, the reserved saffron infusion and beat until well blended. Stir in the lemon juice and beat again. Frost the cakes using a palette knife or icing mold. Looks delicious! Never tried baking with saffron – usually reserve it for biryanis. Wow! These look so gorgeous- and all the ingredients would definitely make a heavenly combination. Yummy! Love the pictures. Deliciousness! Nice pics and recipe :-). I agree Enid Blyton made simple bread taste like yummm cakes…. I've gulped up many noon sandwiches while reading Famous Five! sigh…i wish i should have one…at least one.. Simply wonderful. I am currently in saffron craze too. my persian friend just brought back a bagful from iran and it's so rich in aroma! love the pairing with lemon! So beautiful. I am definitely going to make these. Love the flavour pairing. Thanks for joining us for High Tea. looks gorgeous and ofcourse must taste delightful. Anushruti, one quick observation, on a few of the posts I am able to see the first picture but not the rest of the article. This has happened for a few of your recent posts. i am able to see this one so hopefully the problem is resolved. Yeeey, these look very yummy! Thank you for sharing! very very elegant. just by reading the post title i was thinking the "high tea" :-). I wish we could all really go in person, with such nice things going to the tea. purple foodie: Saffron in biriyanis makes it all the more exquisite. Aru: I have eaten cakes and other goodies while reading her book too. Aparna: You are most welcome. indosungod: Thanks for pointing it out. Will look into the problem. Soma: I want to try your scones sometime soon. These look absolutely beautiful! And something I'll be serving up here very soon. How interesting to add saffron as a flavor infusion. They look just lovely! Lemons are definitely a rare and welcome buy here. You've used them very wisely. Beautiful! Hey Anu!! How have you been? Love the combination of flavors used, never tried pairing saffron and lime together, cupcakes look sinfully inviting, will definately try them, thanks! I have been looking baked goodies recipes without eggs. I would love to try these. Thanks for stopping by my blog! hi! these look great and the combination of flavors is inspired…. i've been looking around for a good cupcake recipe to try out but have been scared off by the amounts of butter and sugar. yours looks perfect – thanks for sharing!! I am definitely bookmarking this recipe. your blog is lovely,i wanted to try this cupcake.i don't have access to fresh shredded coconut, should i use dry flakes or flakes from frozen aile or u want me to use grinned coconut not flakes. rekha: Dried coconut or dessicated coconut works best for this recipe. meenal: I love coconut and seem to use it somehow or the other every day in my cooking. Hope you like these cupcakes. Thanks for the rply dear.but I guess u missed answering my query-is it OK to add fresh pineapple pieces to this cupcake batter..?will it work..? Pls advice.Thnks again. Saffron and Lemon, nice flavours! I loved reading Enid Blyton tooo! I will be making lemon cupcakes for a friend's baby shower. If I omit the coconut part will it work? Do I need to adjust anything else? Please advise. Thanks in advance. 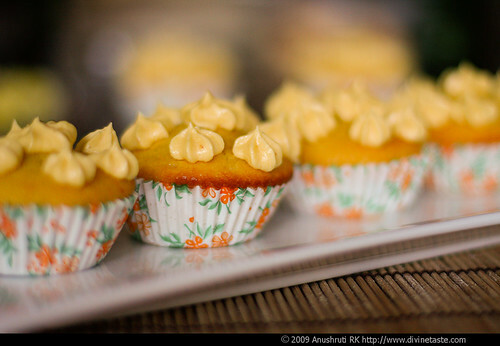 Please help, I need to make lemon cupcakes this weekend. Would it be better to use the vanilla cupcakes recipe? Thanks. meenal: I don't think adding fresh pineapple pieces here is a good idea. Smriti: you can. But if you are making it for a party try the vanilla cupcakes instead as it is a crowd pleaser and always a hit. Thanks Anushruti, will go for vanilla cupcakes. made these cupcakes and everyone loved them, however i would like to have a more pronounced taste of coconut. Can i increase the amount of dessicated coconut in the same recipe? Jinal: Using more dessicated coconut might alter the texture of the cake. You can use coconut milk instead of milk for a more pronounced flavour. I become a regular visitor to your website ever since we gave up onion garlic and began making only prasadam. Thank you so much for helping me in this attempt. I made these cupcakes but they deflated. I followed the recipe and used 2 tsp. baking powder and 3/4 tsp baking soda. I cooked for 20 minutes in the middle rack. What could I have missed to deflate them? Any help is appreciated. Anjali: Thank you for your kind words. Please refer to my baking FAQ for your answers. Also, you might like to try my other cupcake recipes that are easier for beginners. Can this recipe be used for one large cake?